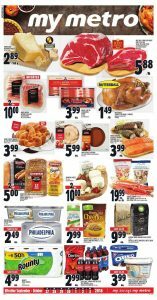 Metro Flyer Thanksgiving Deals 30 Sep 2018 available to check here online. The subject of today’s Thanksgiving is a day that has gained importance with the gathering of all the family members rather than their ornaments. Especially in recent years, special discounts on Thanksgiving Day and the following days began to shadow the Thanksgiving, which was almost worth a holiday. In this week’s article, you can find all the details about Thanksgiving discounts. All good special deals are available in this flyer for sure. Imported meat varieties waiting for you. Thanksgiving entertainings on sale this week. Check out the third page and find your Thanksgiving entertaining deal now. Thanksgiving deals look amazing today. Hurry up and find your favorite food. Did you see Thanksgiving desserts? In this flyer, you will see detailed Thanksgiving deals. But especially check out for dessert. Fresh and delicious Thanksgiving desserts waiting for you. Front Street Bakery produces daily desserts for your tables. Enjoy your shopping with Metro Flyer Thanksgiving Deals 30 Sep 2018.